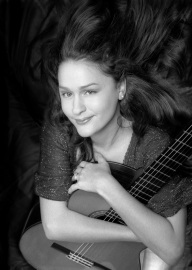 Amanda is one of the leading guitarists of her generation. She has performed and given master classes in the USA, South America and throughout Europe. In the UK her performances include the South Bank, Wigmore Hall, King’s Place and The Sage Gateshead. Her highly acclaimed performances are always noted for their sensitive musicality, fluid technique, and ability to draw the audience in to her world. Several composers have dedicated works to Amanda, including Nato Lima (Sonata No.2, 2004), Robert Boyle (Voices of Origin, for her Wigmore Hall debut 2003), Paul Gregory (Micro Prelude 2000), Cristiano Porqueddu (Amanda 1998) and William Lovelady (This Morning In Omagh the Sun Rose Again, written for the 1st Anniversary of the bombing in N.Ireland 1998). She has performed and been broadcast live on television and radio, both abroad and in the UK. Amanda has also been interviewed and played live several times on BBC Radio 3 “In Tune”, BBC Radio 4 “Woman’s Hour” and Classic FM. In addition to solo work, Amanda is involved in many ensemble projects. The guitar trio ‘Appassionata’ formed in 2004 (with Rebecca Baulch and Hayley Savage) have had many pieces dedicated to them including works by Paulo Bellinati, Gary Ryan and Bruce Macombie. Another project is with the ‘G Plus Ensemble’, composed of string quartet, percussion and two guitars. Last year they released their debut CD ‘Utopia’ which was recorded for Peter Gabriel’s label ’Real World’ and launched during a concert at the Royal Festival Hall, London. Amanda is the classical course leader for IGF’s Bath Guitar Festival & Summer School and teaches at the Guildhall School of Music & Drama. She has sat on the jury for several International Competitions and regularly adjudicates music festivals in the UK. For more information click here to view Amanda Cook’s website.